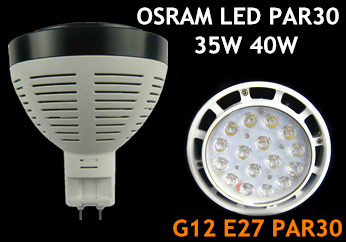 6.New G12 E27 PAR30,led spotlight par30,par30 led bulb. 1.All sylvania par30 40w are with E26/27,G12 base. 2.Don't change the original place design style. 3.Don't need specialized personnel for maintenance and replacement,as long as use our PAR30 light source which be twisted up. 4.Can be used in the 100-240V voltage range,don't need transformer for start. 5.Open and switch off,namely,don't need to wait,can work normally. 6.Energy saving,environmental protection,lower degradation,long service life,light weight.